When the leader of the Yadu family, Vasudeva carrying Thee, he saw the waters of the Yamuna river flooded to the skies. , when he came there; but, wonder the waters were reduced to the ankles of his feet as if by Maya, and he was able to cross the river. kandu seydhaal adhu kaidhavamo, anrich seydhavamo? mindu seydhaalum porukkai nanre, pin verukkai anre. Abhirami-mother! May be once upon a time some devotees could be whimsical without serving you and without worshipping your divine Lotus-feet, and without knowing the eternal truth. I am aware of these. I wonder if I have done like those above devotees . I am at my wits end to know if it means divine-path or an excellent divine service. If I commit anything wrong you shall not hate me but you shall forgive and protect me. 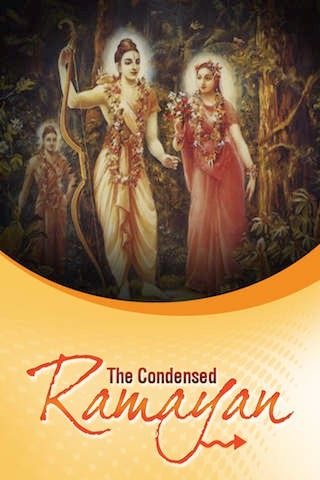 VALMIKI goes on with his barrage of crisp and comprehensive posers enumerating the sixteen virtues to be found in an ideal person on earth; and NARADA eager to extol RAMA’S greatness to VALMIKI, relates the immortal and enduring tale of RAMA, in a nutshell of 90 slokas. Oh Lord ! When Thy hour of incarnation approached, it was the rainyseason, with dark clouds covering the sky. The rays of light emanating from Thy divine,dark blue form, seemed to light up the entire atmosphere. சரீர சுத்தி, வீர்ய விருத்தி Getting a strong body, virility. Purification of body frame. Cures watery diseases. In case of women, develops breasts and enables proper menstruation. thuvalen; ini oru theyvam undaaga meyth thondu seydhe. Abhirami manifests herself as the very form of meditation. She is also the auspicious spouse of our Lord Shiva!. At times she is the mother of Eashwara also. As such, she is considered to be superior to all other gods. Yes! I will not think of any other god except her therefore, I would serve my mother loyally. O Lord Hari! Condensed bliss incarnate! Long ago, in the battle between the Devas and Asuras, some of the Asuras, who did not attain salvation, owing to their remaining merits and demerits, were born again on earthas demons and the earth became terribly afflicted by their burden; so Goddess Earthtook refuge at Brahma's feet, where the gods had already assembled. eri purai meni, iraivar sembaagaththu irundhavale. Abhirami! You have beautiful divine Lotus-feet. You hold the formidable weapons Pasam and Angusam in your hands. You wear the garlands of Lotus, Red-Lilly, Chengazhuneer, Bluebells and Mango flowers on your neck denoting all the five holy scriptures. You are sweet speaking Thiripura Sundari, whose complexion is red. You are present on the left side of Lord Shiva, who had shot the arrow, made out of Meru the mountain to drive the cruel giants who ruled their domain with three fortress walls. I bow to and worship you. Parasurama is one of the Avatars of Vishnu. Parasurama (axe-wielding Rama) is an avataar (incarnation) of Vishnu. Among the ten avataars prominently counted, this is the sixth. 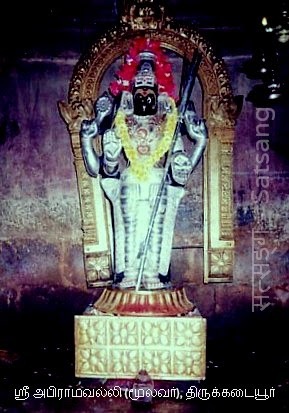 Parasurama is the son of saint Jamadagni. He did penance about Lord Shiva and got an axe from him as weapon. Once, a king by the name of Kaartaveerya-arjuna visited the hermitage of Jamadagni, along with his army during the course of a hunting trip in the forest. Jamadagni arranged to feed his guest and his vast army with the help of his divine cow. Amazed at this, the king became greedy and wanted the cow to be given to him. Jamadagni refused, saying that the cow is required in the performance of religious rites. The king sent his soldiers and forcibly took the cow away to his city. Hearing this, Parasurama went to the king's place and destroyed his army and finally killed the king with his axe. In retaliation, the sons of Kaartaveerya-arjuna killed Jamadagni by beheading him while in meditation and at that time Parasurama was not at home When Parasurama’s father (Jamadagni) was beheaded by a Kshatriya King, his mother Renuka, cried in anguish: "Rama! Rama! Parasurama, who was away from the ashram(hermitage) could ethereally hear the cries of his mother from afar and rushed home. He counted that his mother had called him twenty-one times. On reaching the ashram he saw his father’s head severed from his body. The horrible crime had been committed by the king Kartavirya’s sons. Parasurama took a vow to wage a war against the vile kshatriya rulers twenty-one times and end their rule on earth. Parasurama accomplished his mission by defeating the Kshatriya kings twenty-one times and came to his ashram to pray to his ancestors for restoring his father’s life. The sage Bharadwaja, to whose gotra (lineage) Jamadagni belonged, appeared before Parasurama and restored Jamadagni to life by placing the head and body together. 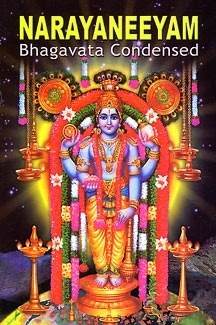 When the Universe became extinct at the Time of Pralaya, only he was present as Narayana who floated on the Great Water Surface as the Unique and Supreme Being. As he was thus lying on water, there sprouted a Lotus from his navel and on top of the stem emerged Brahma who desired to initiate ‘Srishti’ (Creation). He created ten ‘Manasa Putras’or Mind-Born Sons, but prayed to the Supreme Being ie. Maha Deva to empower him with Shakti to take up the exciting task of formal Creation. Then the latter provided ‘Upadesha’(instruction) to Brahma and in turn Brahma gave the Upadesha to his sons who did sincere Tapasya by the recitation of the Panchakshari for thousands of years, consuming only air and nothing else. அஷ்டைஸ்வர்ய ப்ராப்தி For return of people who have gone on journey. For getting eight types of wealth. Balancing and activation of chakras. Balancing of the elements in the body and treatment of ailments related to elements. padam konda algul panimozhi-vedhap pariburaiye! Abhirami! 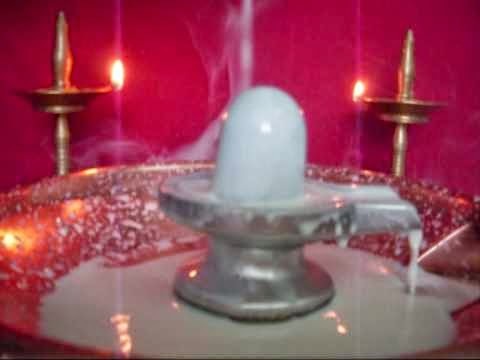 With your broad and bigger sacred bosoms, which have grown parallel and rightly straight and stiff, with pearl necklace on it, you have just moved the heart of our Lord Shiva in consonance to your decideratum (wish and will). Your physique below the waist is like the hood of a Cobra and you speak pleasantly cool and comforting words to the devotees. Your stuffy anklets are four Vedas. I bow down to you and worship you. Bless me Abhirami!.